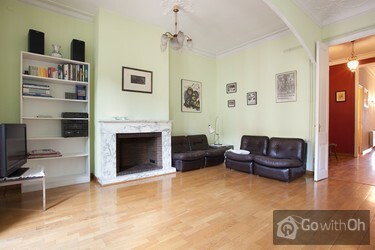 This apartment, in a privileged location is near the city center. It is ready to meet the needs of up to 5 people. It combines very well the original decorative style of the apartment, antique and modernist elements with more recent ones for your comfort, especially in the kitchen and bathroom. 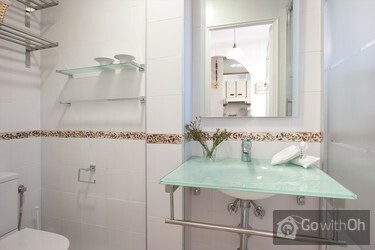 The client will find in it everything you need for a pleasant stay in Barcelona. It has a very spacious and cozy surface (96m2), comfortable for a single person or a couple and really optimal for a family. It has two bedrooms: one with a double bed and another with a single bed. In the living room / office there is a convertible couch into a very comfortable single bed and the living room there is also a convertible sofa into a comfortable single bed too. The kitchen has all utensils that may be needed to prepare any kind of food. The living room, spacious and cozy, will allow you to relax after a busy day exploring space. It also has two balconies overlooking the street and provide a lot of light for the apartment. The balcony doors have thermal and acoustic insulation so from the inside you will be isolated from the temperature and noise outside. It is very easy to get around on foot, because everything is very close. The area is safe and quiet, full of shops and supermarkets as well as cafes and restaurants. In the next street is the El Ninot municipal market, recently restored and the Hospital. The main spots in the area to highlight are, Can Batllo and Casa Mila "La Pedrera" (Gaudí) Can Ametller and the Fundacio Tapies (Domenech i Montaner). Walking distance, you can go to Plaza Catalunya. Las Ramblas, the Gothic Quarter, etc. As for public transport, you can take the metro on line L5 at the station Hospital Clinic or the many bus lines (54, 58, 64 and 66). The airport bus in Plaza Universitat is an 8-minute walk. It has a room-wardrobe with a large closet, a computer and free Wi-Fi, safe, TV, computer, air conditioning, heating. Third floor with lift with a private code that directly leads to the apartment, in a building with one property per floor. This apartment does not have stipulated check-in and check-out times. The owner will adapt to the check-in and check-out times that are convenient for the client (subject to availability). However, any arrivals later than 22:00h and departures earlier than 07:00h are subject to an additional charge of 25 . Cot is available at no extra charge, but needs to be requested prior to arrival. The stairs to the apartment are steep and narrow but the apartment itself was clean, spacious, quiet and comfortable. I felt the kitchen to be slightly under-equipped but this is really a minor point. The apartment is situated on a busy street, but as the traffic dies down in the evening and the ...bedrooms are located to the rear of the property, there is no problem with noise at night-time and during the day you will be out enjoying Barcelona. Local facilities include a small general store just across the road next door to a quiet bar, there's also a good bread shop just two streets down. A 10-15 minute walk takes you to Placa de Catalunya, from where all of Barcelona's central sights are easily reached. We were met at the apartment by the couple who own it and they could not have been more helpful, taking the time to ensure we knew where everything was and leaving a contact number in case we had any problems - needless to say we didn't. The good points: Well the location is great the apparment is nice and spacious. The design of the rooms sadly only allows to have 2 bedrooms. As we arrived everything was in place. The downside where the bathroom and the shower. Very low pressue on water - if you do love good showers I would ...not recommend this apparment. Also we found the dirtiness of the floor a bit annoying. Walking around bar feet after arrival we all had black feet. As a comment to elderly and impaired people thinking of staying here. The apartment can only be reached through a high up very narrow staircase. The building will have an elevator in future but not sure when this is going to happen. The advertisement said the apartment was on Level 3, but it was on Level 5. Thesignage in the building ignored the first 2 floors and only counted the final three floors. It was a very long climb and the stairwell was narrow and dark. Sólo comentar lo que ya comenté a los propietarios y es que la bañera desprende un olor a veces insoportable, no sé si por los sifones del propio edificio o por qué pero era, a veces, horrible. Creo que por ese precio se podría mejorar eso. Lodemás bastante bien. Ah, es un cuarto piso más que un tercero, eso también. 10/10 Excellent acceuil. Nous avons été merveilleusement reçus. Accogliente, spazioso e completo di tutto. The apartment was bright and clean and spacious, and very well fitted out. The beds were comfortable and the furniture and fittings very suitable. The nearest under-ground station was only a block away. We had a lovely holiday. The owners were charming. Thank you. 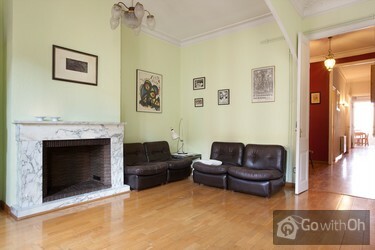 Logement correspondant au descriptif, calme et vaste, parfait pour 2 ou 3 personnes. climatisation apprèciée, proximité du marché et du métro. Acceuil sympathique du propriétaire, très disponible. Logement propre manque juste une bouteille d'eau fraiche à l'arrivée! Die Kontaktperson war überaus freundlich und hilfsbereit. Eine schöne Ferienwohnung mit allem was man braucht um in Barcelona eine schöne Zeit zu haben.Wir haben uns sehr wohl gefühlt.Die Ausstattung ist sehr gut,es wurde an alles gedacht.Die U Bahn Station ist direkt um die Ecke blaue Linie 5 Bushaltestelle, Supermarkt und Bäckerei in direkter ...Nachbarschaft.Der Kontakt zum Vermieter war sehr gut und unkompliziert.Die Wohnung liegt im dritten Stock und ist über eine schmale Treppe zu erreichen.Das kann für ältere Besucher anstrengend werden da kein Fahrstuhl vorhanden ist. TV gibt es nur in spanisch aber das braucht man in Barcelona nicht unbedingt. Dafür gibt es einen Computer mit Internetanschluss, den kann man kostenlos nutzen und sich alle Informationen holen die man benötigt. Very clean, well appointed and good value for money. Contact person very easy to deal with. Highly reccommend. We really appreciated the apartment, located a ten minute bus ride from Plaza Catalunia. The apartment was everything it was promised to be. Very comfortable and the air conditioning really helped during the hot weather. The computer was also useful as it helped us check things from the apartment ...without having to go to an Internet café. The contact person was waiting for us when we arrived and very helpful. You have a sense of living in the real Barcelona in this neighborhood, yet the tourist attractions are still accessible. Recommended. Apartment is very well furbished and equipped. Everything works (kitchen, air cond, wash machine, etc). Landlords are very friendly and professional. I would repeat the experience. I just reccomenf to bring light baggage or small bags as bringing your stuff up can be painful. 9/10 Appartement spacieux et calme. Il est possible de se rendre à plusieurs sites à pieds. Les propriétaires transmettent des informations utiles. Accueil très sympathique et chaleureux des propriétaires. L' appartement est très bien situé et correspond aux données du site. il est néanmoins un peu difficile d'accès avec des enfants car il est situé au 4ème étage sans ascenseur. 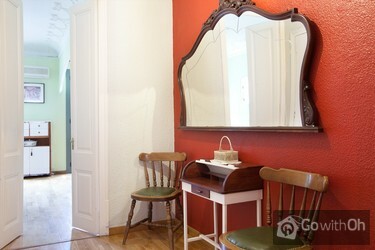 The apartment was wonderful, in a great neighborhood with a great market close by, and many top-rated restaurants. 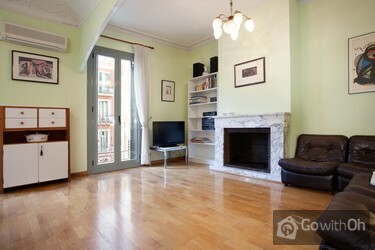 We would highly recommend the apartment and the beautiful Eixample neighborhood. The contact person was wonderful and was able to communicate with me with my limited French. A perfect apartment for a small family. Lots of space, clean and very well located - there's a wonderful indoor food market and a supermarket just around the corner, metro and buses take you where you'd need to be, and to be honest some of it's walkable if you're like us and like to wander the ...streets! Nice owners too many thanks M. and J. All very straightforward - many thanks for helping make it a great break away. Sehr schöne große Wohnung, liebevoll eingerichtet und perfekt ausgestattet. Alles sehr sauber und ordentlich. Parkettboden. Kostenloses Internet dabei. Lage sehr gut. Ausgesprochen nette Eigentümer, die auch nachts auf uns gewartet haben (späte Anreise). Nachteile: Schlafzimmer hat kein direktes... Fenster; Bad sehr klein; 4 lange enge Treppen ohne Aufzug. The apartment was thin and dark, with one of the single beds in a corridor, and the other one in a very small room. The area has a good selection of supermarkets, but is quite a long way from Las Ramblas, and the sea, and doesn't have any nice parks nearby. The check in and check out was smooth and on time. The owners are helpful and lovely people. The apartment is fully equipped with everything you can think to feel at home. Even some basic cooking stuff (oil,vinager, salt,pepper). We really appreciated this. We would definitely reccomend it! The appartment is not suited for people that can't walk ...up stairs (4 floors) and the two sleeping rooms don't have a window to the outside world. For us it was a little srange. On the other hand it was very silent. alloggio buono nel complesso. ubicazione perfetta da un punto di vista logistico ma ovviamente un po' rumorosa. persona di contatto eccellente. ci siamo trovati bene e siamo soddisfatti di tutto. la personne de contact (le fils de la propriétaire) n'était pas tres sympatique comparé au rapport cordial de la propriétaire durant nos correspondances avant nôtre arrivée. Trés reactif oh-barcelona, vous nous avez rapidement proposé une solution àu problème, rien à redire. Great size, great location, the balconies caught the afternoon sun. I'd recommend this apartment without reservation and would certainly stay there again. I was slightly apprehensive about neither bedroom having an exterior window (I'd read this on the comments page before booking) but the ...ventilation arrangements were actually fine and the rooms were lovely and quiet. This was my first experience of Oh-Barcelona and I must say it was excellent. Appartement correspondant aux photos, très bien. Pour se déplacer à pieds, l'appartement se trouve un peu trop loin, obligation de prendre le taxi pour rentrer tard à moins de marcher. Personnes de contact très sympathiques. 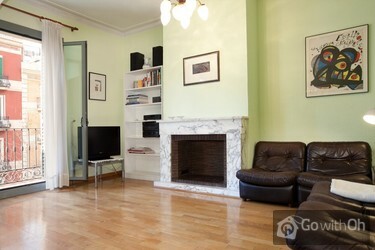 Really spacious, lovely apartment situated close to the University. The owners are very gracious and accomodating and we appreciated their flexibility. There are several markets close by and the metro is just a few blocks and very easy to use. Having a washing machine enabled us to pack very ...lightly. There is no dryer but clothes can be hung on the line outside the kitchen or on hangers inside the apartment. overall we had a wonderful stay in Barcelona. Appartement tres spacieux, tres bien placé. Logement très agréable et bien équipé. Ordinateur avec internet apprécié. Immeuble très calme. Personnes de contact charmantes et disponibles. Un séjour parfait. Eine sehr schöne Wohnung und sehr angenehme und Hilfsbereite Gastgeber. It is a lovely apartment. Very comfortable and well kept. Very agreeable owners, nice quiet building in a nice quiet safe neighborhood. Considerable charm and wonderful light. We wish we were still there. Die Vermieter waren sehr freundlich und hilfsbereit. Die Lage der Unterkunft ist wirklich gut. Man hat eine gute Anbindung zu den öffentlichen Verkehrsmitteln. In der Umgebung gibt es schöne Cafés, Restaurants, viele kleine Supermärkte...Zur Wohnung an sich: sie ist schön eingerichtet und ...geräumig, ein guter Standart. Wir haben es sehr genossen und können es nur weiter empfehlen. Die Wohnung war erstaunlich ruhig, was allerdings daran lag dass beide Schlafzimmer keine Außenfenster haben. Dadurch kommt fast kein Tageslicht in die Wohnung, was uns alledings kaum gestört hat. Hervorzuheben war dass in der Wohnung ein funktionierender Laptop mit Internetanschluß zur ...Verfügung stand. Die Wohnung war in einem sauberen Zustand. Die Sitzmöbel im Wohnzimmer waren schon recht alt und sollten mal durch besser gepolsterte ersetzt werden. We had a super time staying in this apartment. Merce and Xose were very helpful - they were particularly accommodating about dropping off luggage early and leaving it to collect later on our check out day as we had an evening flight. The apartment was spacious and well appointed - a home from ...home. If you have young children, you will be interested to know about the various play areas inside some of the Eixample blocks. We only found the local one on our last day. 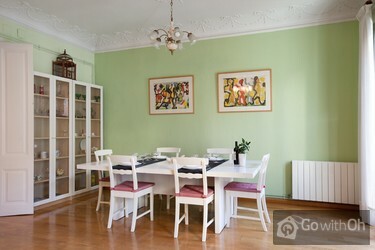 http://www.proeixample.cat/eng/1000/1145.html There is also an excellent ice cream parlour one block away at C/Muntaner 161 - Cremeria Toscana. Wir wurden von den Vermietern herzlich empfangen. Beide sind sehr cooperativ und entgegenkommend. Wir durften unsere Gepäck früher abstellen und bei Abreise auch länger in der Wohnung lassen. Die Wohnung ist sauber und entspricht der Beschreibung/Bildern und ist ist mit allem ausgestattet. ...Haarföhn, Bügeleisen und sogar Regenschirme liegen bereit. Sie ist zentral und sehr gut mit den öffentlichen Verkehrsmitteln zu erreichen. Barcelona ist immer eine Reise wert und hier waren wir sehr gut aufgehoben. Owners were extremely helpful and welcoming. Apartment was lovely, bright and airy - the only downside was the unpleasant smell in the bathroom (nothing that a little air freshener and bleach didn't sort out) and the 67 ish stairs we had to climb to get to the 5th floor apartment. We had read that... there was no lift but don't think we were prepared for just how many stairs there would be - OK for us but my 80 year old mother found it a little difficult at times! Still we managed! The apartment was ideally located for us to walk/bus/metro to all the attractions we wanted to see. Many local supermarkets and restaurants. Would highly recommend - if you don't mind the stairs!!!! 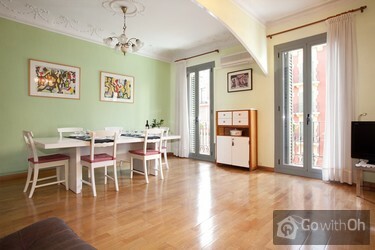 This is a lovely apartment in a very nice part of Barcelona. Metro stations are close by to get you everywhere else in this wonderful city. The apartment was clean, comfortable and offered every amenity you could want. 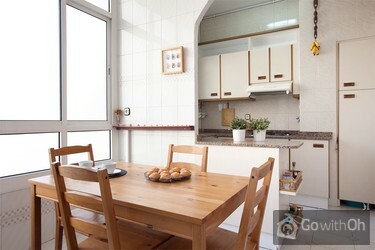 When we return to Barcelona we will look for the availability of this apartment first. Appartement très propre, très bien situé, étonnamment calme pour sa situation assez centrale (métro à 5mn environ, haut des Ramblas à 15mn) : en fait 3ème étage (donc assez haut par rapport à la rue + double vitrage). Personnes charmantes, parlant Français ce qui peut être d'une bonne ...aide pour un soucis avec l'administration. Un très bon séjour dans ce bel appartement. On reviendra dès que possible. Sehr schönes, gut ausgestattetes Appartment in guter und ruhiger Lage. Fast alles ist fußläufig erreichbar, z.B. ca. 15 - 20 Min bis zum Beginn der Ramblas. Wer nicht laufen möchte, kann die nächste U-Bahn Station in 500 Entfernung benutzen. Beware a little odor in the bathroom and to climb to 3'd floor. Laptop was'nt the latest model, but wifi Ok.
La propietaria esos dias no estaba, pero nos atendió su hijo. Llegamos antes de lo previsto, pero ya estaba alli. muy atento se ofrecio a ayudarnos en todo. El apartamento estaba en una zona cerca del metro, que en grandes ciudades es lo más importante ;) con columpios para los niños cerca y ...supermercados y tiendas diversas en la zona. Aunque estaba el hospital a una manzana no haabia excesivo ruido de ambulancias... ni de nada, zona tranquila. El alojamiento muy bien, bonito. techos altos, grandes ventanales en el salon... muchos elementos decorativos pequeños que los niños pueden tirar (por si vas con niños, lo primero a levantar todo a 1.5 metros). Vale que no tiene ascensor, y que salia un olor raro por el baño, pero es parte del encanto de los edificios del siglo XIX. The flat is in very nice and safe area. Lots of shops, cafes and small restaurants and not so many tourists around. It`s also very easy to get around, bus-stops are just nearby. Flat is actually in fifth floor (in Finnish standars), so prepare yourself for real training; it`s really quite ...challenging if you`re not in good shape : D We didn`t mind. Owners are very helpful and decent people. First we were bothered about smell from sewers and then some noises from upstairs. Owner solved both problems immidiately but I must say, that first two weeks without neigbors upstairs were so much nicer and less-noisier than two weeks with the new neighbors around. Isolations in the house arent`t too good. Overall I can still recommend this place, especially if you are able to stay up late. Nice apartment on the 4th floor! decorated with a personal touch. The matrass was a little too firm, but this is usual for Spain. Complete kitchen, Perfect wifi. Nice neighborhood. Die Wohnung war so schön wie beschrieben. Sie liegt im dritten Stock und ist über ein sehr enge Treppe erreichbar, aber der Fahrstuhl ist schon fast fertig :-) ! Wir, beide über 50, haben die Treppen gemeistert und auch die Wege in die Stadt per Pedes. Zu den wichtigsten Attraktionen, den ...Ramblas, das gotische Viertel sowie Park Güell, kann man leicht in etwa 20 Minuten zu Fuß gelangen. Die Wohnung liegt in einem sicheren und ruhigem Viertel. Die Wohnung selbst ist sauber, perfekt eingerichtet, Fernsehen nur spanisch bzw. katalanisch. Es steht ein Laptop mit Internet zur Verfügung und Wifi. Der Abfluss im Bad riecht etwas, aber bei guter Lüftung nicht störend. Auch fehlende Fenster in den Schlafzimmer durch indirekte Lüftung (Küchenfenster) waren kein Problem. Wir kommen gerne wieder! La ubicacion muy buena y el departamento es espectacular para 3 ó 4 personas. La desventaja es que es en un 3er piso por escalera, pero justo cuando llegamos estaban terminando de poner el ascensor. Faltaba la habilitacion del mismo. Die Beschreibung der Unterkunft entsprach voll und ganz dem Eindruck vor Ort. Die Lage der Unterkunft ist ideal, um von dort die Stadt zu erleben. Die Vermieter sind sehr zuvorkommend und hilfsbereit. large, light, loads of shops, supermarkets and bars nearby. The apartment is large and lovely. Particularly loved the artwork. Will be perfect once the lift is functioning (to happen very soon). Die Wohnung hat eine schöne Atmosphere und ist sehr liebevoll eingerichtet. Sehr geehrter Kunde, wir danken Ihnen für Ihre Kommentare, die wir gerne berücksichtigen werden. Der Vermieter bestätigt, mit den Nachbarn gesprochen und diese angewiesen zu haben, in Zukunft jeglichen Lärm zu unterbinden und die Ruhezeiten einzuhalten. Diese versicherten hierbei, dass es sich um einen Einzelfall handelte, der sich nicht wiederholen wird. Die Vorfälle wirkten sich allerdings nicht auf die Qualität der Wohnung aus. Les + : Appartement grand, calme et bien situé; climatisation vraiment bienvenue, métro à proximité Les -: les chambres n'ont pas de fenêtre donnat sur l'extérieur, la salle de bain est très petite, la cuisine a des vitres opaques et le vaste salon ne nous a pas servi. Pour deux personnes, le rapport qualité /prix reste très moyen. Es hat alles gepasst und es gab keine Probleme, freundlicher Vermieter, alles einwandfrei! decisamente da migliorare la pulizia dell'appartamento in particolare della cucina. non positivo il fatto che le stanze da letto non hanno finestre. The apartment is very comfortable and well furnished, the hosts most accommodating, and the location is truly excellent. Our only complaint was some noisy neighbors, but that can happen anywhere. Extremely clean and easily accessible from the metro. Full amenities. The only thing that could be improved would be faster WiFi. Il nostro soggiorno a Barcellona è stato di nostro gradimento. La casa era bella, posizionata in una zona centrale e il proprietario è stato cortese e disponibile con noi. Beautiful apartment, excellent location. Very comfortable for 4 people. 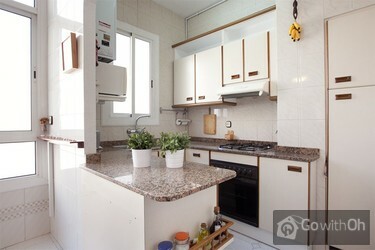 Kitchen is equipped with basic service for 4, coffee maker, full size refridgerator. 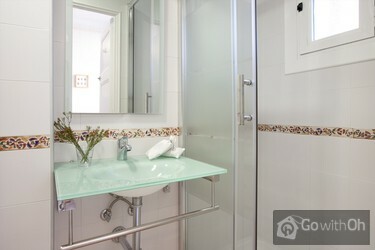 Owners are lovely people, and have lovingly decorated and cared for the apartment. nette sehr hilfsbereite Gastgeber! Eine sehr saubere tolle Wohnung, mit allem was man sich wünscht. Het appartement is nog ruimer dan je op de foto kan zien. Alle voorzieningen waren uitstekend. Alles was aanwezig en goed onderhouden. We hadden een hartelijk welkom en kregen bruikbare tips over eetgelegenheden en parkeermogelijkheden. Zelfs toen ik mijn auto desondanks fout parkeerde en deze was... weg gesleept was de gastheer zo vriendelijk dit samen met mij op te lossen door mij gelijk naar het depot te brengen en door Barcelona mij weer terug te geleiden naar het appartement zodat ik gelijk weer op reis kon. Geen enkele kritiek, alleen maar lof. Die Wohnung ist wegen des Verkehrslärms sehr laut aber es hat uns trotzdem sehr gut gefallen. The apartment was spacious, clean, and nicely decorated. M was wonderful to work with and provided us with everything we needed to make our stay comfortable. The apartment is located in on a very nice safe street, within immediate walking distance of many stores and tapas restaurants, and only a ...short walk away from major Barcelona attractions. Highly recommend! Die Lage ,nicht zu touristisch, mitten in einem Wohngebiet, schöne Jugendstilhäuser, alles zu Fuß zu erreichen, tolle Markthalle ganz in der Nähe, dicht an der Metro. Todo el apartamento muy bien, limpio, espacioso y agradable. Lo único a destacar como negativo, proviene del piso de arriba, ruidos, caminando fuerte y a cualquier hora incluso a las 3 de la mañana. Estimado cliente, agradecemos y valoramos sus comentarios. El propietario confirma haber hablado con los vecinos del piso de arriba para evitar futuras molestias. Schicke Wohnung, Schlüsselübergabe problemlos - wir waren zufrieden. El apartamento esta muy bien y los propietarios muy amables. Esta bien situado y el muy espacioso.El unico inconveniente pero no es culpa del alojamiento es que el aparcamiento en Barcelona es complicado. Pero sin dudarlo repetiria. Accueil chaleureux, excellente situation. Parfait!